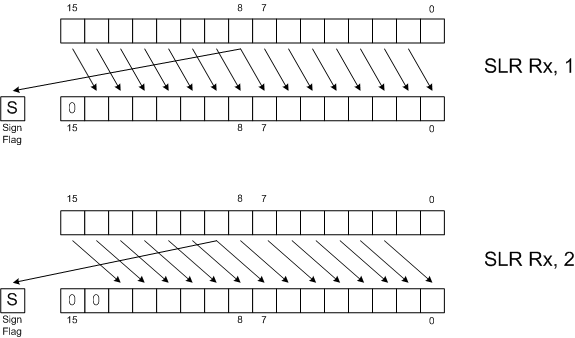 The Shift Logical Right (SLR) instruction shifts the bits in the specified register either one (1) or two (2) bits to the right, stores the result back to the specified register, and sets or clears the Sign Flag and Zero Flag according to the new value in the register. The rightmost one or two bits are discarded and the leftmost one or two bits are set to zero(0). The number of clock cycles used depends on the number of shifts specified. One shift will use 6 clock cycles and two shifts will use 8 clock cycles.